Posted: Fri Apr 27, 2007 3:36 pm Post subject: Can I play too? Posted: Fri Apr 27, 2007 11:48 pm Post subject: hooray!!! You should definitely come too!! 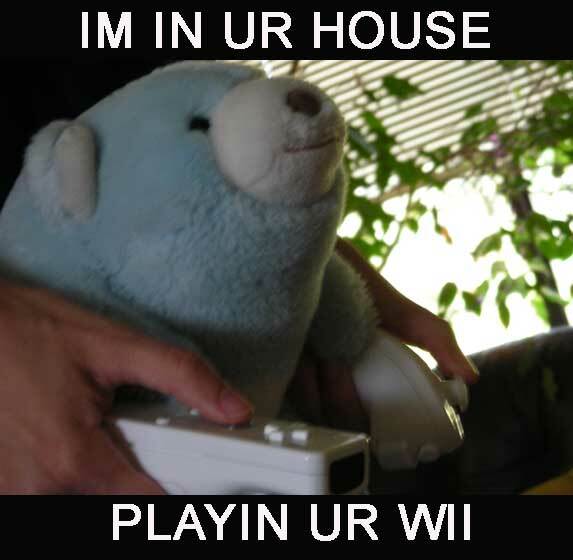 I would love to show you the Wii and play some Wii with you!!! I took yesterday off work and played Zelda all day. It was fun- I rescued a lot of monkeys and acquired a VERY POWERFUL boomerang. But then I turned back into a wolf and that part is too hard! Maybe you can help me pass that part. Can't wait to see you Snuffs!!! Posted: Sat Apr 28, 2007 12:38 am Post subject: Lee rescues monkeys! Yay cool! I'll do the stickers! I can't wait to show you the Wii!! I've been playing a lot more Zelda lately. I got some IRON BOOTS and used them to impress the GORGONS of DEATH MOUNTAIN. Then I've been playing this lava mine level. It's awesome because I can magnetize some of the walls and then I can put on my IRON BOOTS and walk on walls and ceilings- it's really neat. Anyhow I've picked up a really powerful BOOMERANG and a BOW AND ARROW at this point so it's really cool. This game also involves a lot of combat while riding my HORSE so that's pretty fun. I had to do a JOUST against an evil dude riding a warthog. Anyway, Zelda is great game. Woot! Posted: Tue May 15, 2007 10:31 pm Post subject: Wheeeeeeeee! Lee that was awesome getting to hang out with you and play the Wii! You were so good at the Wii! I think I was starting to get the hang of it too. 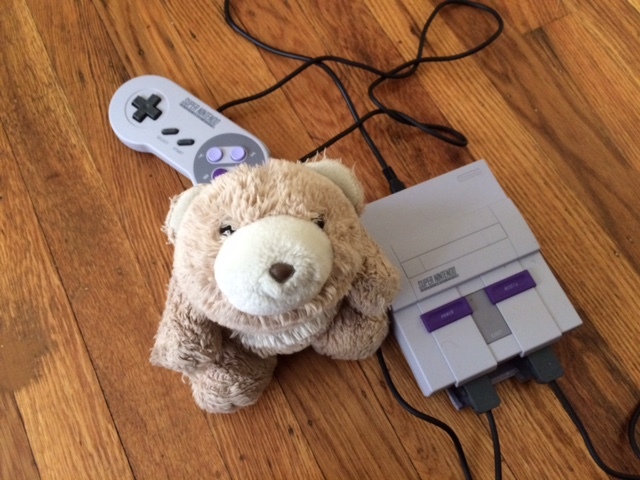 They should make smaller controllers for the littler bears. Let me know what happens next in Zelda! Wow, I didn't know Snuffles had thumbs. Apparently there are some cavemen in Halo 3 and one of them has a teddy bear! Don't shoot the bear! I have two exciting things to tell you!! First, did you hear that there are STICKERS in the new Stephen Colbert book??? You should read it!! And use the stickers!!! Second, I played some Zelda last night. It had been a while. I made it to the Desert Temple. So I'll keep you posted on how it goes. Posted: Mon Oct 15, 2007 1:02 pm Post subject: Firefly Halo! Did you know that Captain Mal and Jayne do voices for the new Halo 3 game? It's true - Jayne's character even mentions his gun 'Vera' and Mal's says 'Reynolds out' after talking. Hey look at this game! Those guys look like they're having fun. Anyone want to play this with me? Wow, this old moldy forum thread hasn't been updated in over 10 years! BUT TODAY IS THE DAY!!!!! Usually there is not much reason to leave the malm. But on Friday, Lee's roommates went to GameStop and acquired a mini-classic-SNES somehow! We bears had only heard legends of such things existing and had discounted them as pure myth. But apparently it's real! And inside this Nibs-sized-console is every classic game we grew up with: MarioKart, Super Marioworld, Zelda, FinalFantasyIII, FZero, Starfox, Contra3, Donkey Kong Country, Street Fighter 2 to name a few. Wow. We can't believe it! Wish we had had this when PEACHES visited!! Here is me sitting next to this tiny thing for scale! So tiny! Will the introduction of a console after all these years create waves of chaos in Lee's grad school studies? Or will it be a nice distraction from the support land of WorkFuzzy? Only time will tell! Regardless, it definitely makes us miss the 90s and all our good times playing these games together!